Intended for use in outdoor applications, the VisuNet IXD has a high-brightness display and an optically bonded touch screen that reduces reflections, increases light transmission, and enables improved picture quality for optimal viewing in high ambient light. An optional sunshield protects from direct sun. The projective capacitive multi-touch display is protected with security glass, making the VisuNet IXD much more rugged than conventional workstations. All components of the display unit are made out of anodized aluminum and powder-coated. The VisuNet IXD can operate in temperatures ranging from -20 °C up to +60 °C and is globally certified for hazardous locations (IECEx/ATEX Zone 1/21). A key advantage of the VisuNet IXD is its modular design. It consists of a display, power supply, and computer and enables operators to replace components independently in the event of a failure. This makes field maintenance easy and reduces costs associated with downtime. With only 23kg the VisuNet IXD enables easier mounting in different applications with no need for a costly, heavy-duty pedestal. A variety of mounting options is available: Wall brackets and yoke, pedestal, VESA, and panel mounting ease the installation and increase installation flexibility. Fuel has become indispensable in our society. It is produced in refineries via elaborate chemical and physical processes that are supported and monitored by digital technologies. This all takes place in real time in central control rooms and on-site by plant operators using modular HMI PCs or thin clients such as the VisuNet IXD with hazardous-location approvals. The IXD can withstand direct sunlight and temperatures of up to +60 °C. The 19-inch high brightness display has an optically bonded touch screen that minimizes reflections and improves image quality and contrast. The optional sunshield effectively counteracts direct sunlight. 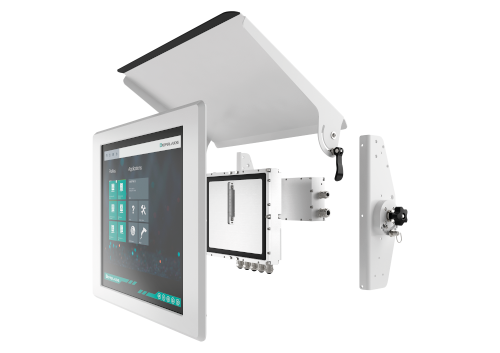 The VisuNet IXD is also suitable for harsh environments. Temperature changes ranging from -20 °C to +60 °C have no influence on the functionality and service life of the VisuNet IXD. The powder-coated aluminum housing is optimized for the outdoors, preventing corrosion in rain or snow. A key advantage of the VisuNet IXD is its modular design. It consists of a display, power supply, as well as a computer and enables operators to replace components independently in the event of a failure. This makes field maintenance easy and reduces costs associated with downtime. Unlike other Zone 1/21 solutions that are bulky and heavy, the VisuNet IXD is the lightest in the industry, weighting approximately 23 kg. This enables easier mounting in different applications. A variety of mounting options designed for different applications are available: Wall brackets, yoke, pedestal, VESA, and panel mounting ease the installation and increase installation flexibility. An optional sunshield protects from direct sun and can also be used as mechanical protection during non-operation. Each VisuNet IXD Remote Monitor is equipped with VisuNet RM Shell 5, the latest generation of firmware for our thin client solutions. The VisuNet RM Shell 5 firmware is pre-installed and pre-configured for various control systems. This makes it quick and easy to get Pepperl+Fuchs thin clients up and running. The latest generation of RM Shell is based on Microsoft® Windows® 10 IoT Enterprise LTSB, which includes long-term security updates by Microsoft. In addition, RM Shell 5 comes with integrated security mechanisms that give the system reliable protection from malware and viruses. RM Shell 5 firmware is available for every VisuNet device from Pepperl+Fuchs. It enables a complete thin client solution for process industries—from BTCs in the control room down to remote monitors as VisuNet IXDs in Zone 1/21. And with VisuNet Control Center software, plant operators can configure, monitor, and efficiently manage all devices from one central point.